Why not create the perfect oasis in your backyard this season by installing or refurbishing your existing hardscape design? Imagine a winding walkway, paver retaining wall, top-of-the-line outdoor kitchens, or a beautiful water feature cascading into your luxury swimming pool. Seems like something pulled out a dream, right? Well, now your dreams can transform into reality with the help of a pool service professional. Figuring out the perfect hardscape features for your home is time-consuming, which takes away from your relaxation time. Luckily, the luxury designers of Shoreline Pools bring you the latest backyard hardscape trends for 2018 that can make your backyard feel and look like the paradise you’ve always imagined. For starters, you can bring the joy of cooking to your outdoor patio. That’ right! It’s time to bring the kitchen heat to the fresh outdoors. Consider installing features that your indoor kitchen may not include such as a firebrick oven or stainless steel barbeque. Designing a dream kitchen for a grill master or culinary chef is the place to let your imagination run wild. Iron chefs can choose between grill sizes, gas or charcoal, and even the color. Installing a deluxe outdoor kitchen is sure to have the neighborhood talking and their stomachs growling. For 2018, incorporating a mosaic path into your backyard adds an elaborately designed, exquisite pop of color to your home’s aesthetic beauty. Mosaic paths can consist of pebbles, glass, or even seashells. With the endless design potential, expert pool construction professionals can implement your personality into a hardscape work of art. Not sure where to place this pretty path? Try adding a mosaic path leading into a garden, pool, or even your mailbox to bump up your curb appeal. Why not bring the relaxation found inside your home to a chic and plush outdoor seating area? Creating a living room in your backyard adds an endless amount of entertainment possibilities. Purchasing a few all-weather furniture pieces makes a beautiful arrangement that requires almost no upkeep. For additional features, consider including a projector to watch movies or a wet bar. This element will be sure to bring the party outside on warm evenings. Whether snow is on the ground or a flickering starry sky, fire pits create a warm space for activities ranging from reading to socializing, to entertaining. Why limit roasting s’mores to camping? Install a fire pit in the backyard to give you year-round access to the smoky smells and fun a campfire provides. Ignite an entertaining evening and sit back in an Adirondack chair for a night of warmth and conversation. Fire pits come in a variety of sizing and material options, with both wood and gas burning options. 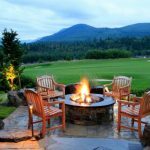 Depending on your budget, you can have a trusted pool construction professional customize your fire pit to fit seamlessly into your patio or the surrounding landscaping. In comparison to other materials like concrete, natural stone turns up the aesthetic factor. When it comes to the appearance of any hardscape, aesthetics can make or break the amenity. Natural stone offers a beautiful, natural look that out-lasting other design trends. Not only does natural stone prove more durable, it also comes in a variety of textures and hues such as field stone, bluestone, limestone, slate, or river stone. These choices allow customization in patterns to showcase in other areas of your backyard. Consider having a top NY or CT pool construction professional lay slate stone as steps to a retaining wall or scatter river stone in between garden beds. Water features such as fountains, stone vases, and even pool waterfalls add elegance to any backyard. Water features are trendy in 2018 because they amplify the landscaping while seamlessly fitting within the rest of the backyard design at a fairly reasonable price. The flowing water of a waterfall or fountain adds to the serenity needed for a perfect backyard getaway. Want to make a bold statement? Try adding a pop of color to your favorite hardscape feature. You can choose bold colors for your mosaic tile, firplace tile, or for other accessories as well. If you want to install a water feature in a basin, consider choosing a turquoise, robust red or burnt orange versus a neutral one that gets overlooked easily. Spruce up your living space and make it feel like you are on vacation in your backyard. From cooking outside to meditating by your water feature, your backyard is the perfect getaway, social center, or relaxing retreat. Consider these new hardscape trends in 2018 to give your home a new and fresh appearance. 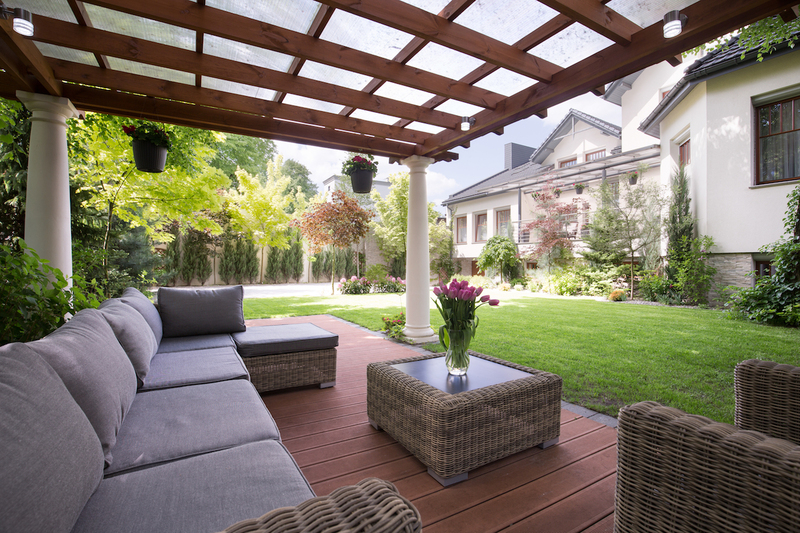 As warmer days approach, working with an experienced designer can maximize your patio and backyard appeal. Want to know which features would work best in your backyard? Contact Shoreline Pools today, the leading pool installation and service company in New York and Connecticut.